No need to curb my enthusiasm – spring is here! It’s time to take a break from all the recent negativity and let a little of my spring-induced joy leak out. Andrew and I went to visit the Arnold Arboretum on Lilac Sunday, which coincided with Mother’s Day. Maybe that happens every year, I don’t know, but it was just the leverage I needed to get Andrew to agree to go. Sadly, it held no sway with Hannah, who opted to stay home. We took the MBTA to the Arboretum by way of Downtown Crossing and the Orange Line. I’ve only been on the Orange Line a few times in my life and since it passed through stations I had only heard of on the news, the ride itself was a mini-adventure. Our end-of-the-line destination was Forest Hills. I didn’t even know Boston had a Forest Hills; Forest Hills is where my cousin lives in New York. In any case, I enjoyed the ride and at the end we followed the crowd to the entrance of the park; a short walk from the station. I always thought that the Boston Public Garden was our urban oasis; Boston’s answer to Central Park. Now I know better. At twenty-four acres, the Public Garden is less than a tenth of the size of the Arboretum, which is almost 300 acres. The website says it was established in 1872, “…planned and designed in collaboration with Frederick Law Olmsted, the Arnold Arboretum is a National Historic Landmark…” You don’t have to spend much time there to see why. Even though it’s a bit of a schlep, I certainly plan to go back. There’s something vaguely magical about taking public transportation through the city to such a glorious place. 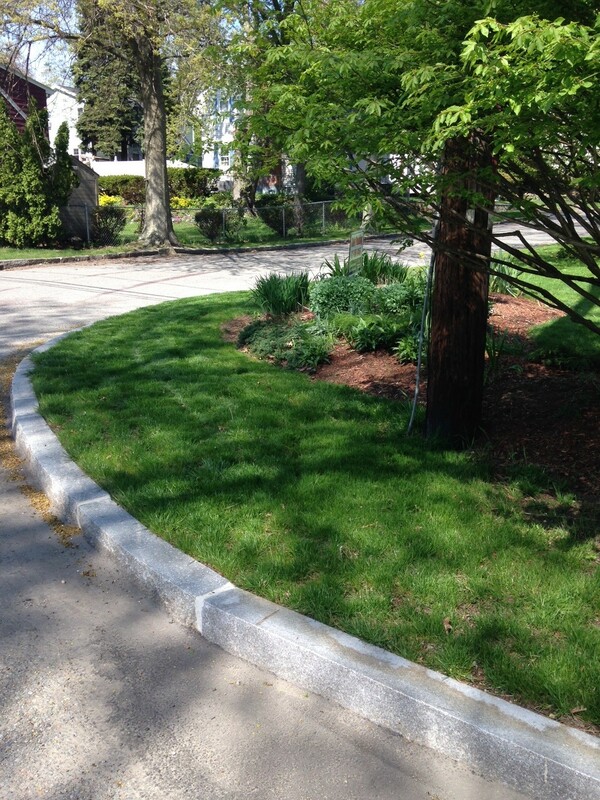 A final note while celebrating the arrival of spring; about a year ago I wrote a post called, Appealing for a curb, in which I described our plan to have a curb put in front of our house. Peeved that the town wouldn’t pay for the work, I wrote, “I’ll be dogging the contractor every step of the way to make sure we don’t give up one iota of lawn that we don’t absolutely have to…” Well, not only did we not give up any lawn, we gained a whole bunch more. See the large tree in the foreground of the photo below? That’s where the road used to meet our property. Our Arlington landscaper, Joe Cusce of Black Diamond Landscapes, increased our lawn in order to line up our property with the neighbors across the intersection. And the best part is that the curb worked as desired and protected our property from the snow plows. We’ve started spring without the usual grousing about the shape of our front lawn. And I love the way the curb looks. If you’re tired of redoing your lawn every spring, call Black Diamond. It will be money well spent. This entry was posted in Uncategorized and tagged Arlington MA landscaper, Arnold Arboretum, Boston Public Garden, Central Park, Mother's Day, spring. Bookmark the permalink. I must confess I’ve never been to the Arboretum. And now I really want to go! Thanks, Judy! And Vicki, you can take the T! But–but–but what about the aroma? Was it just, um, fertilizer? I’ll have to write to the Arboretum and ask. There was occasional evidence of horse (nudge, nudge, wink, wink), but I like that smell, too, and that wasn’t the smell around the lilacs.